Please note that the statements and views of the author expressed herein may not necessarily state or reflect those of the Government of Canada or the. 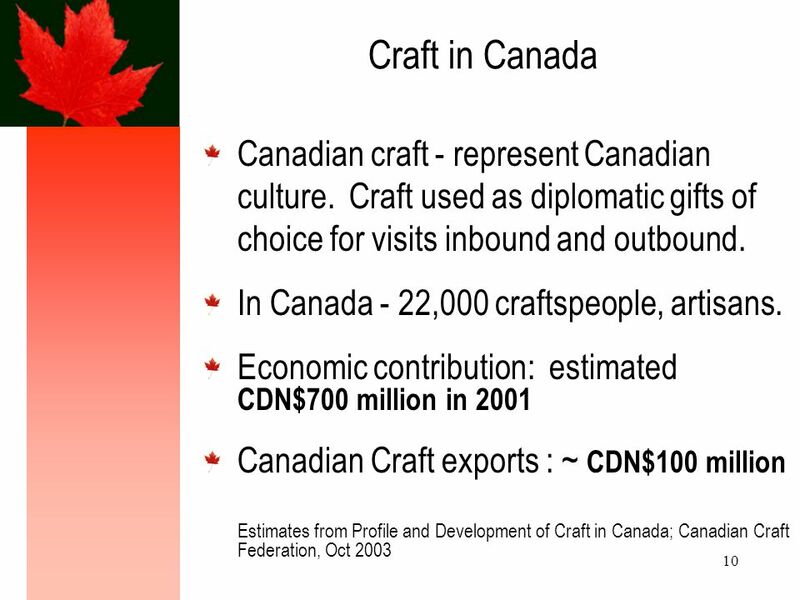 2 2 Contents Culture in the Canadian economy: exports, GDP contribution, employment. Support program for cultural exporters. 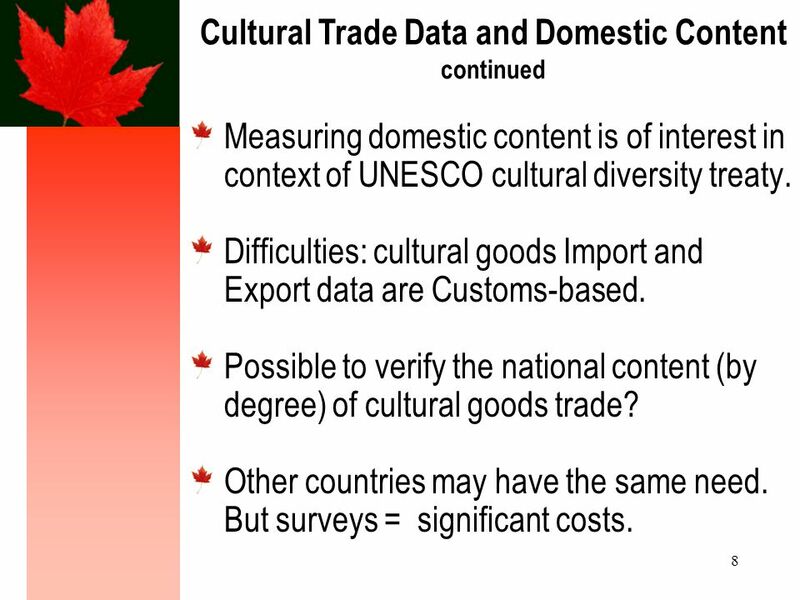 Uses of cultural trade data. Policy makers request domestic content measure. Data gap: Craft. 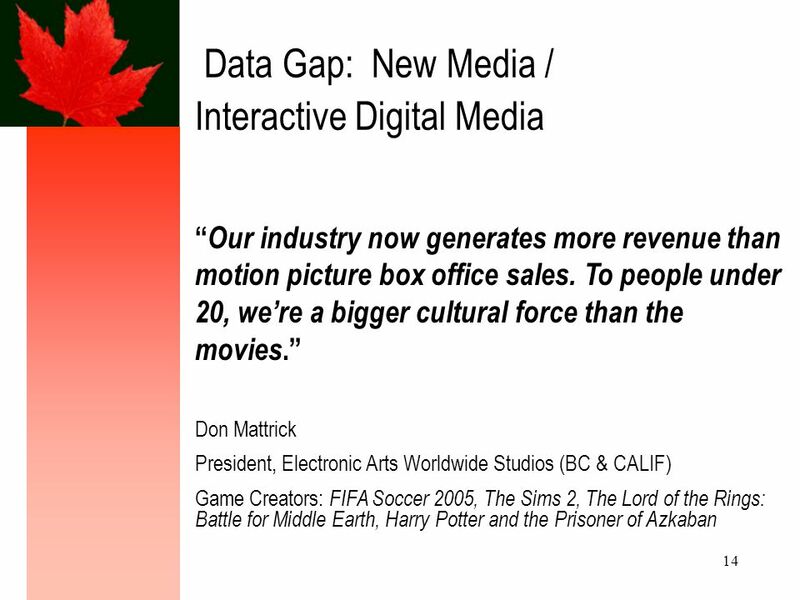 Data gap: new media / interactive digital media. Data gap: downloads and other Conclusion. Questions. 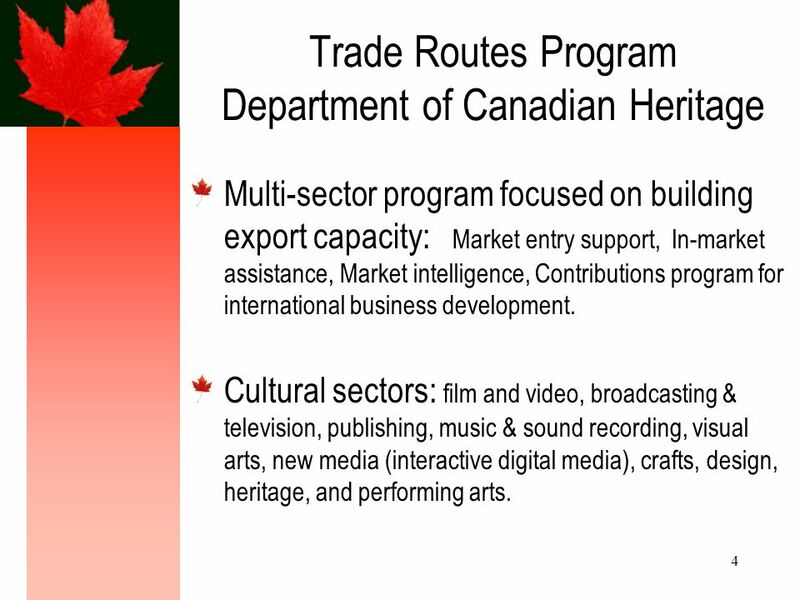 4 4 Trade Routes Program Department of Canadian Heritage Multi-sector program focused on building export capacity: Market entry support, In-market assistance, Market intelligence, Contributions program for international business development. 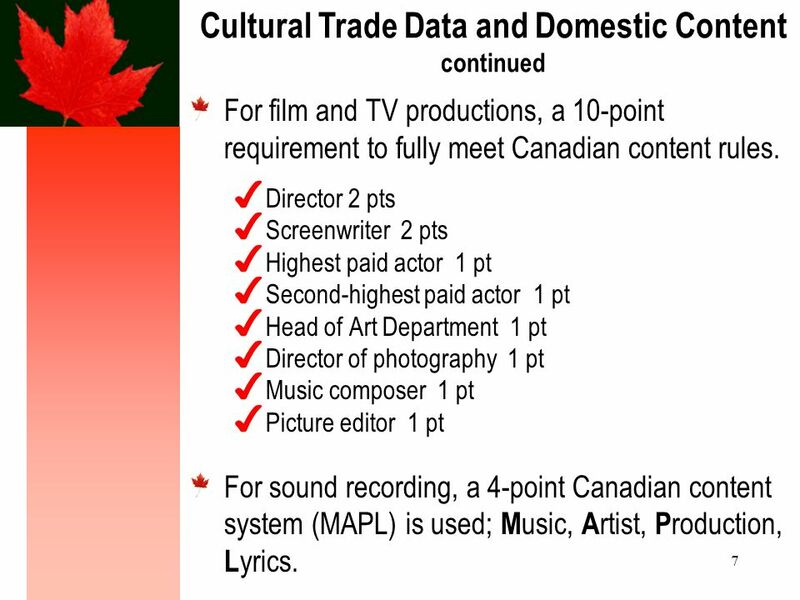 Cultural sectors: film and video, broadcasting & television, publishing, music & sound recording, visual arts, new media (interactive digital media), crafts, design, heritage, and performing arts. 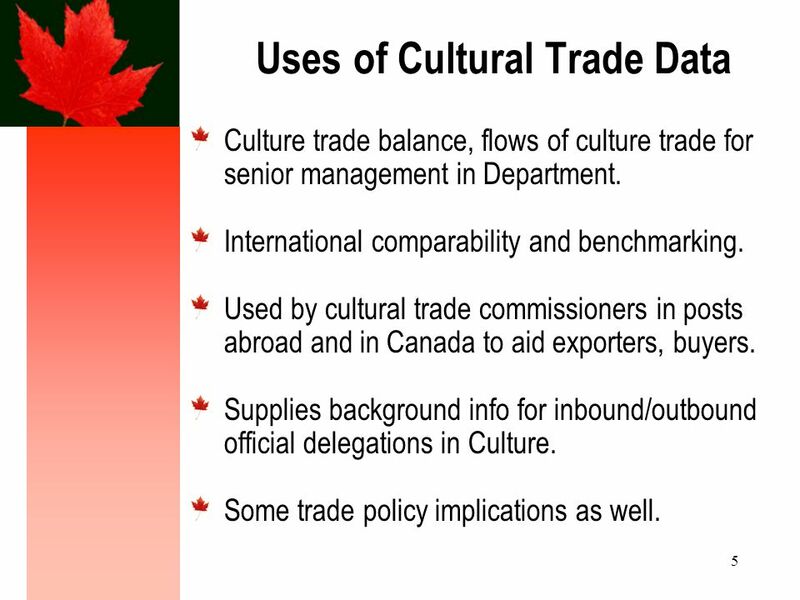 5 5 Uses of Cultural Trade Data Culture trade balance, flows of culture trade for senior management in Department. International comparability and benchmarking. 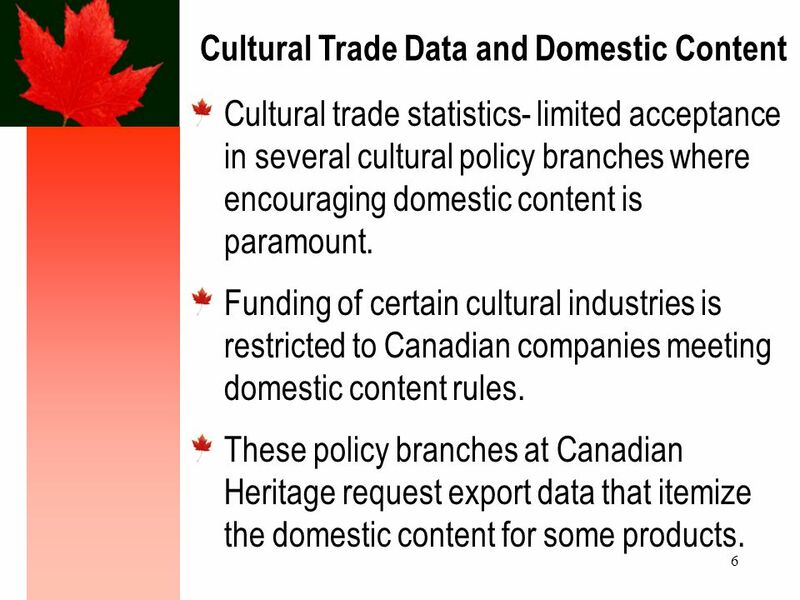 Used by cultural trade commissioners in posts abroad and in Canada to aid exporters, buyers. Supplies background info for inbound/outbound official delegations in Culture. Some trade policy implications as well. 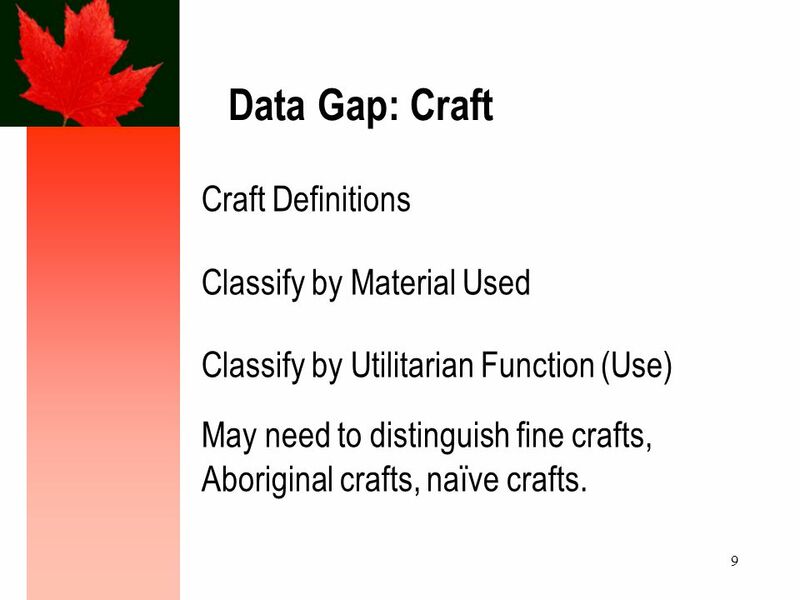 9 9 Data Gap: Craft Craft Definitions Classify by Material Used Classify by Utilitarian Function (Use) May need to distinguish fine crafts, Aboriginal crafts, naïve crafts. 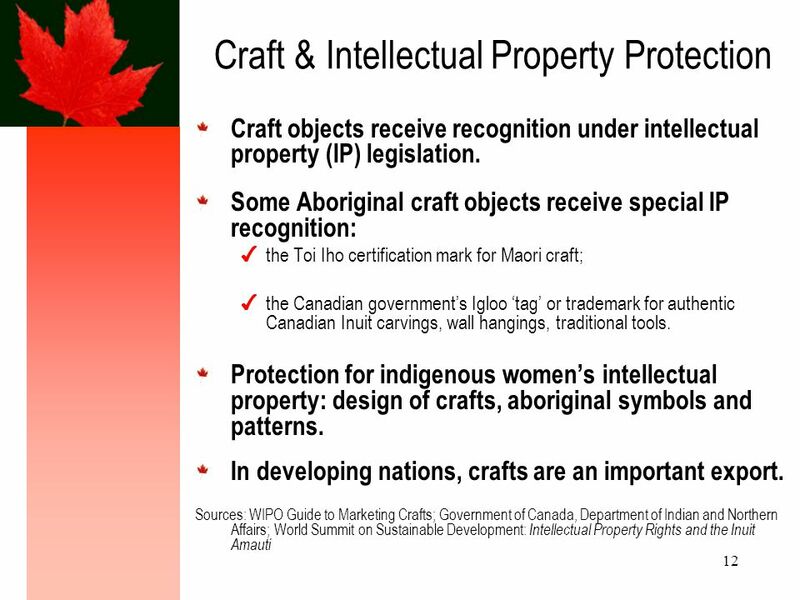 11 11 Crafts Now Classified in Manufacturing Crafts - little in common with manufactured objects. 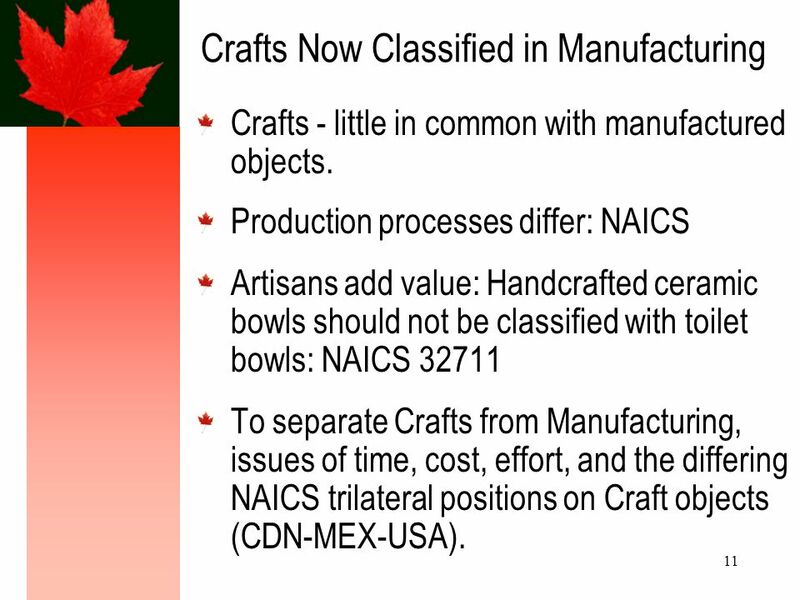 Production processes differ: NAICS Artisans add value: Handcrafted ceramic bowls should not be classified with toilet bowls: NAICS 32711 To separate Crafts from Manufacturing, issues of time, cost, effort, and the differing NAICS trilateral positions on Craft objects (CDN-MEX-USA). 13 13 Measuring Crafts: Some Considerations Separate Crafts from Manufacturing. Production processes are different. 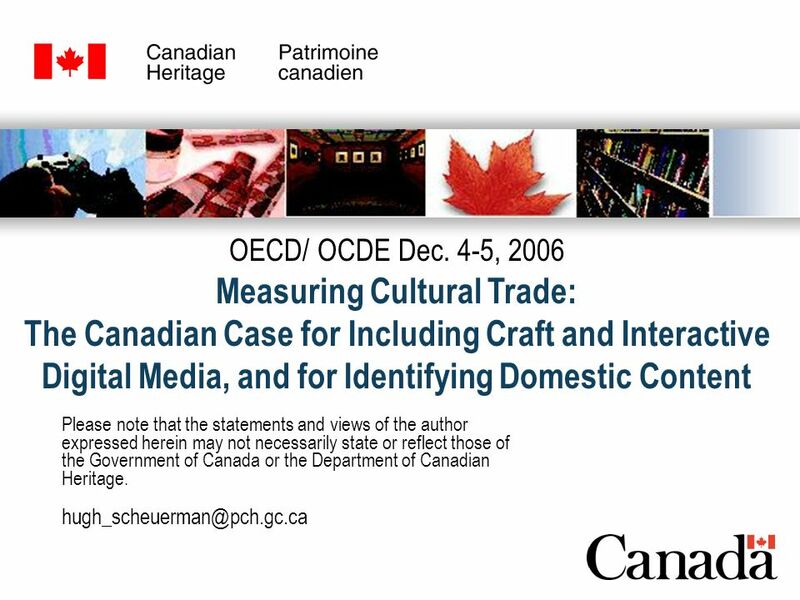 World Customs Organization, UNESCO ask member nations to measure Craft. Craft occupations are already in Culture. Classify by the media used, or functionality. 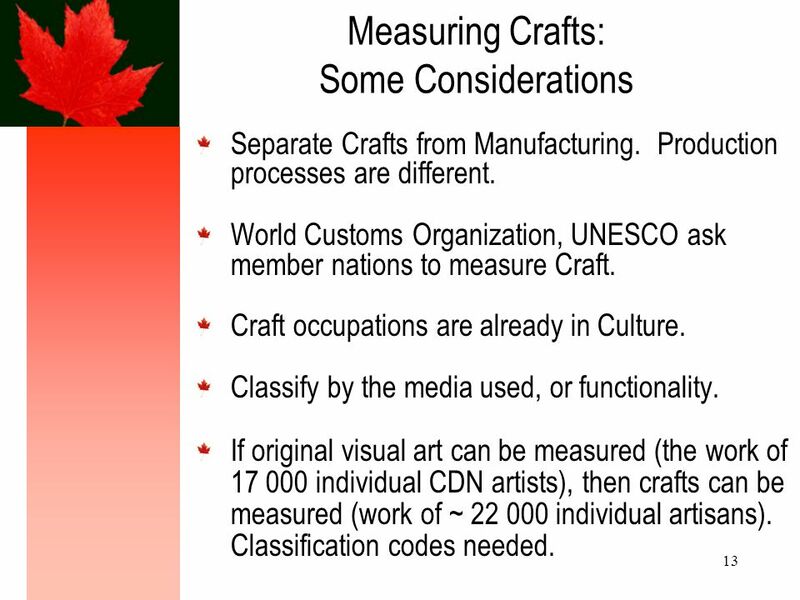 If original visual art can be measured (the work of 17 000 individual CDN artists), then crafts can be measured (work of ~ 22 000 individual artisans). Classification codes needed. 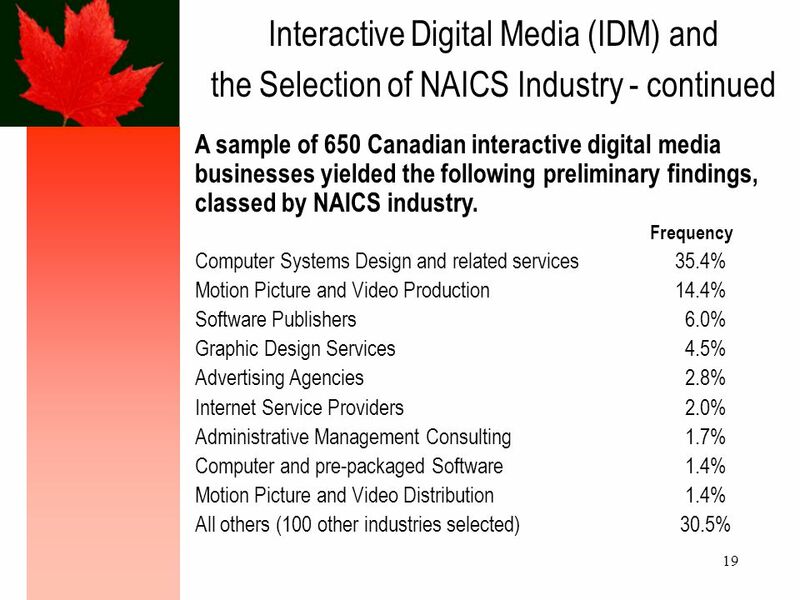 17 17 Interactive Digital Media (IDM) and the Selection of NAICS Industry Problem: Classification systems often dont recognize new media / IDM as a distinct entity. Question: How do interactive media companies classify their principal business activity in NAICS? Context: Companies operating in Canada require a Business Number (BN) for taxation and other administrative purposes such as Import/Export. 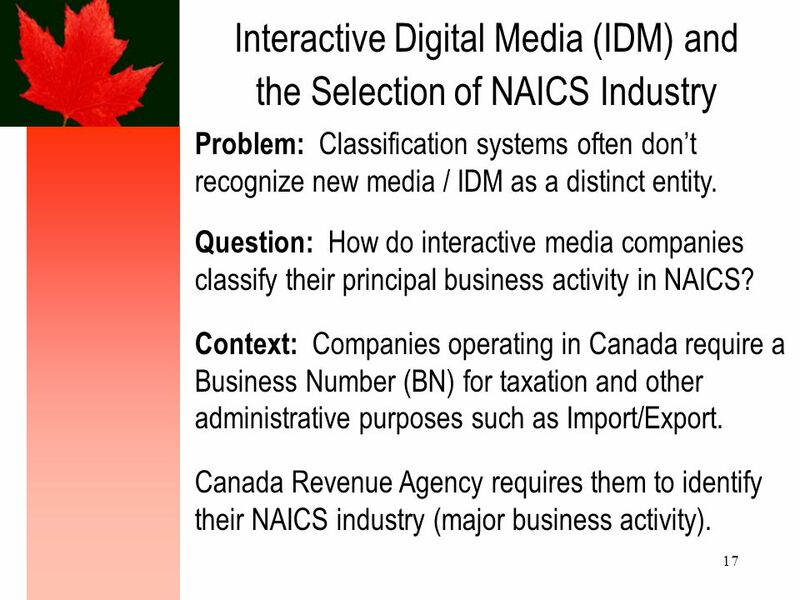 Canada Revenue Agency requires them to identify their NAICS industry (major business activity). 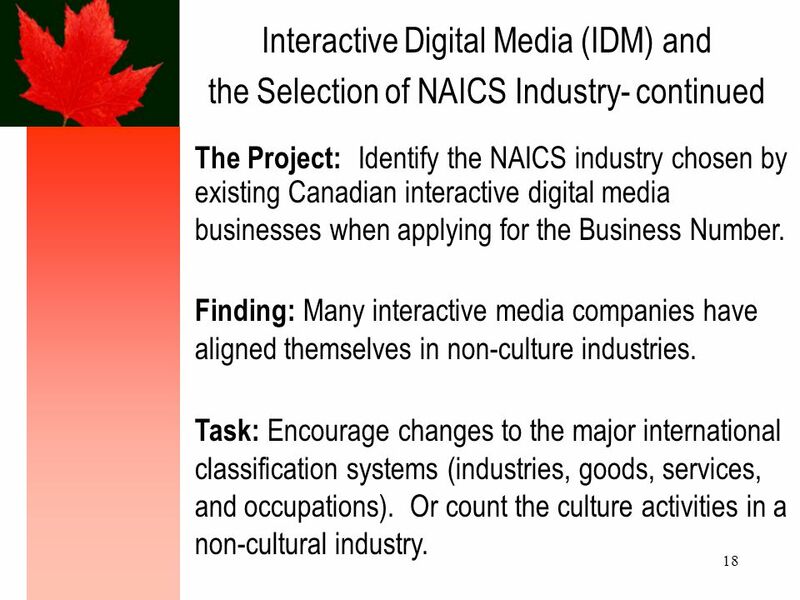 18 18 Interactive Digital Media (IDM) and the Selection of NAICS Industry- continued The Project: Identify the NAICS industry chosen by existing Canadian interactive digital media businesses when applying for the Business Number. Finding: Many interactive media companies have aligned themselves in non-culture industries. Task: Encourage changes to the major international classification systems (industries, goods, services, and occupations). Or count the culture activities in a non-cultural industry. 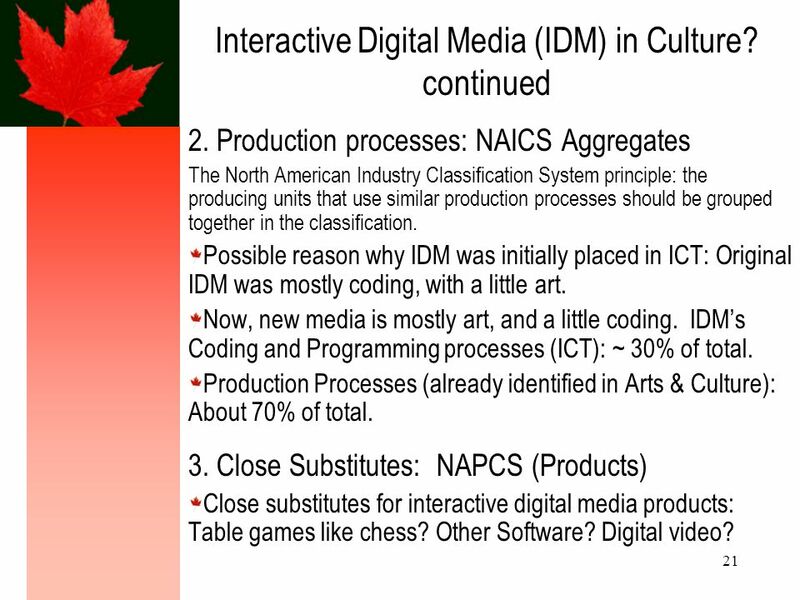 20 20 Interactive Digital Media (IDM) in Culture? 1. 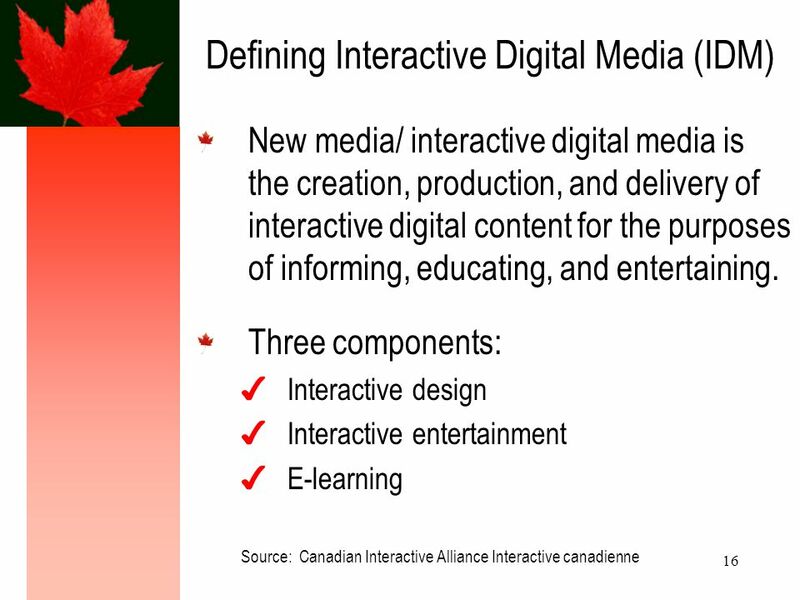 Interactive media has two components: Content creation, and Coding. Identify content creation to separate IDM from Information and Communications Technology (ICT). 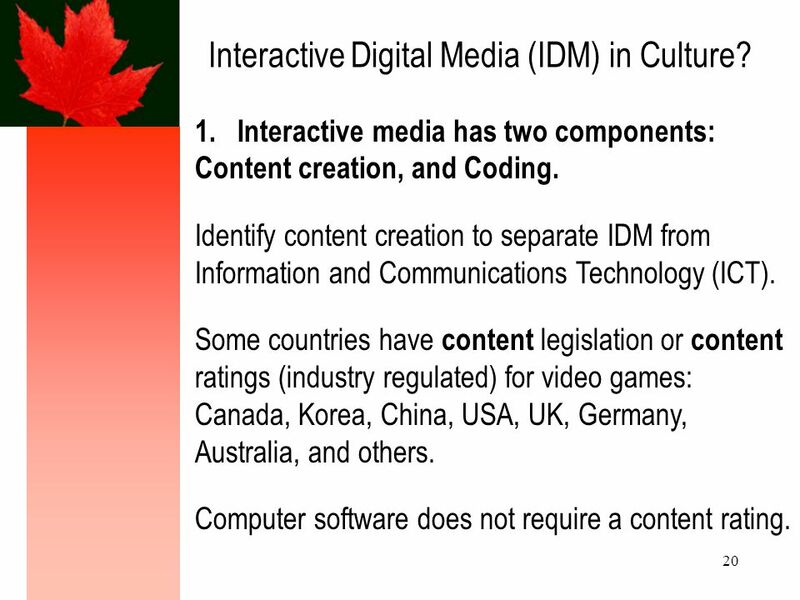 Some countries have content legislation or content ratings (industry regulated) for video games: Canada, Korea, China, USA, UK, Germany, Australia, and others. Computer software does not require a content rating. 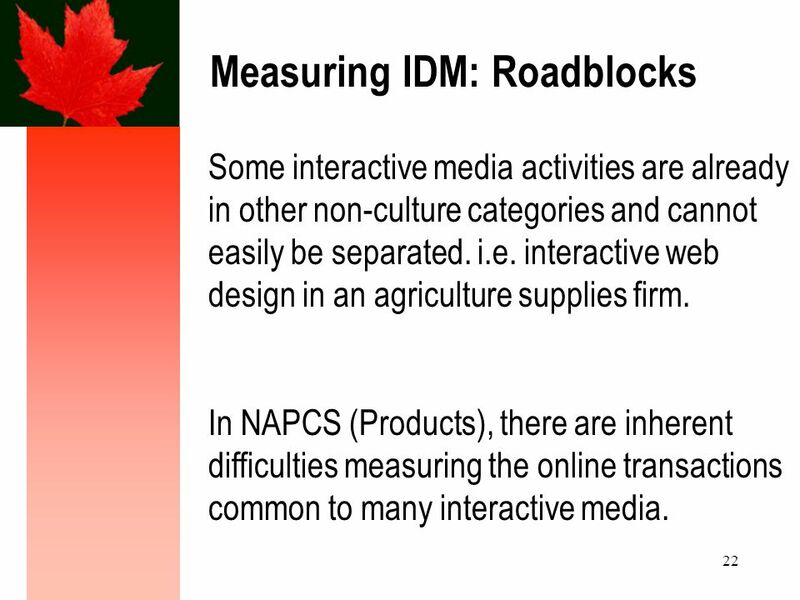 22 22 Measuring IDM: Roadblocks Some interactive media activities are already in other non-culture categories and cannot easily be separated. i.e. interactive web design in an agriculture supplies firm. In NAPCS (Products), there are inherent difficulties measuring the online transactions common to many interactive media. 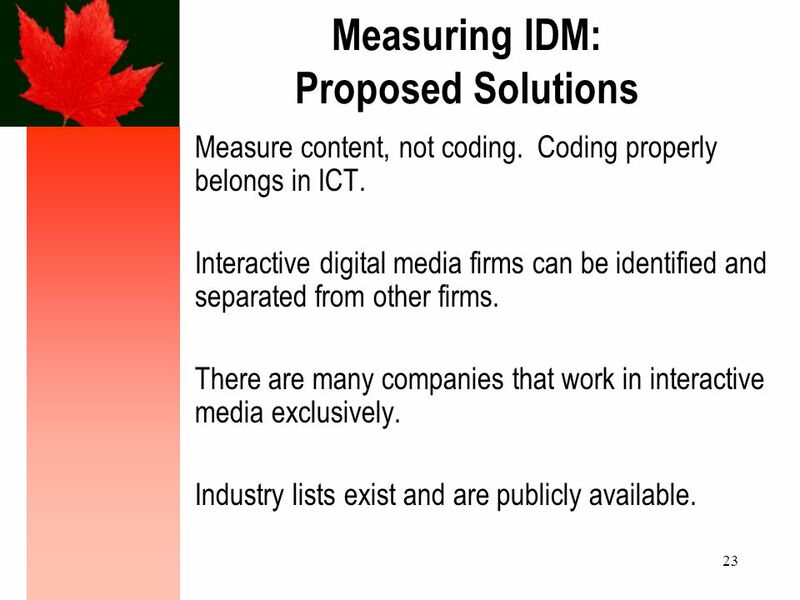 23 23 Measuring IDM: Proposed Solutions Measure content, not coding. Coding properly belongs in ICT. Interactive digital media firms can be identified and separated from other firms. 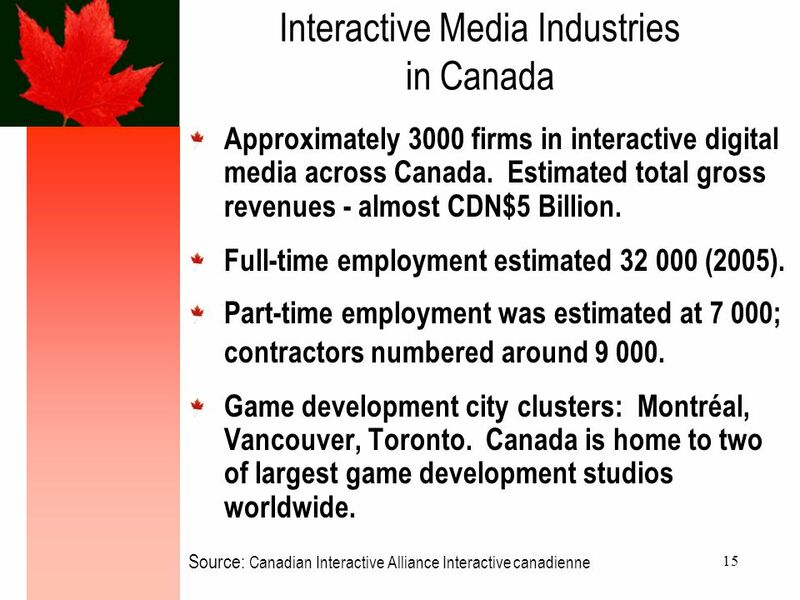 There are many companies that work in interactive media exclusively. Industry lists exist and are publicly available. 24 24 Other Culture Measurement Gaps to Address Need measurement of downloads: music, television, film, video on demand, online games, books and magazines, etc. Music: copyright collection societies. Royalties for Copyright industries, for Design. Classification revisions needed in 2012, if not present in 2007 revisions. Download ppt "Please note that the statements and views of the author expressed herein may not necessarily state or reflect those of the Government of Canada or the." 1 OECD National Accounts WP October 2004 ISIC Revision 4: Top-top Structure for reporting data by activity: What are national accounting needs in revision. SEMINAR ON INTELLECTUAL PROPERTY AND CREATIVE SMALL AND MEDIUM-SIZED ENTERPRISES IN DIGITAL ENVIRONMENT Geneva, May 20-22, 2008 WIPO Creative Industries. The production of broadcasts and remuneration of rights: a business perspective A presentation by Godfrey McFall, Senior Associate, Oliver & Ohlbaum Associates.